Among rock’s great singer-songwriters, few have been more concerned with the sound of their music than Paul Simon. His entire career has demonstrated experimentation, from the intricate harmonies of the early Simon & Garfunkel days to the use of African rhythms that made Graceland such a huge success in 1986. 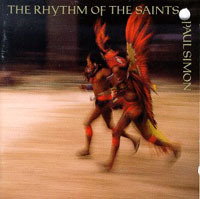 While it didn’t achieve the popularity of Graceland, Simon’s 1990 release The Rhythm Of The Saints took the next logical step in exploring rhythm and ranks among the most compelling albums of the 1990s. While many of his peers were content to coast through the decade on the fumes of nostalgia, Simon continued to produce groundbreaking, interesting material. On Rhythm, Simon is joined by a number of Brazilian musicians, including Olodum, a samba reggae group most noted for its drum work. As both the songwriter and producer, Simon blends these Brazilian sounds with a mix of African instruments, synthesizers and his familiar acoustic guitar stylings to create a unique and multi-layered sound on each song. The album’s first and arguably best track, “The Obvious Child,” demonstrates this instrumental prowess perfectly on a long introduction that features the many drums of Olodum. The lyrics speak of aging and looking back, but when combined with the energetic drum track, give the song an unusual hope. By juxtaposing these two themes, Simon sets the tone for the entire album, which manages to be both reflective and calm throughout. While Graceland’s “The Boy In The Bubble” expressed wonder at the advance of technology, “Can’t Run But” speaks of the dark side of progress, from Chernobyl to the commercialization of the music industry. This track personifies the change in Simon’s writing for this album. So does “Proof,” which proclaims “faith is an island in the setting sun, but proof is the bottom line for everyone.” But it does so with a genial tone, not a damning indictment. Simon’s skill as a storyteller is as evident as ever on songs such as “The Coast” (a tale of musical family) and “Born At The Right Time” (a discussion of both childhood and overpopulation). And his use of Brazilian music is exquisite on the love examination “She Moves On” and the nature homage “Spirit Voices.” On the former, saxophone and other horns help create the mood for a song about how “maybe these emotions are as near to love as love will ever be.” On the latter, background vocals sung in Portuguese blend well with Simon’s voice to create a beautifully simple folk song. This album has already stood the test of time, as Simon regularly performed a number of its tracks on his 1999 concert tour co-headlined with Bob Dylan. And it also holds up within the context of his discography, adding a new sound to his ever-expanding repertoire. Paul Simon has been less prolific than some of his peers because he spends years between albums, writing on a daily basis and perfecting the material. But while he only released two albums during the 1990s (1997’s Songs From The Capeman was the other), Simon remained relevant by taking a new direction on each record and incorporating more musical influences under the umbrella of rock. Now more than 40 years after his first appearance on the charts, Paul Simon continues to expand his craft. And as The Rhythm Of The Saints proves, he still has interesting places to go.